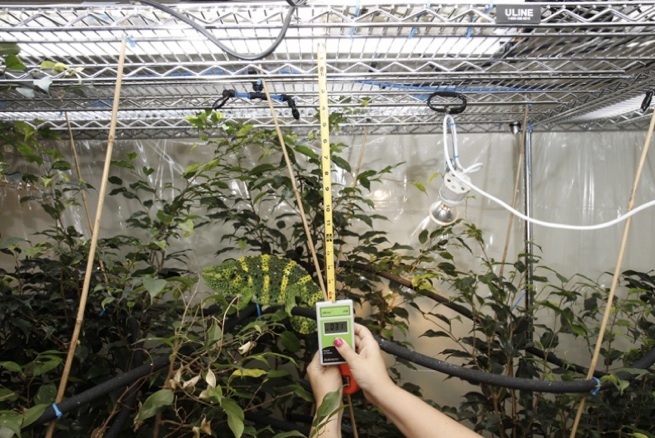 Ideally we would want our artificial light sources to be able to produce the daily energy levels and spectral content of natural sunlight and combine that with a well-planted environment so that our chameleon would be able to choose the level of exposure desired at any time during this daily cycle. Generally, due to cost considerations and availability, we’ll have to settle for a bit less than the ideal indoor lighting system. How much UVB does my chameleon need? This is one of the most often asked questions and there is not an abundance of scientific research available to answer it. This is true even for the most commonly kept species such as Panthers (Furcifer pardalis), Veileds (Chamaeleo calyptratus), and Jackson’s (Trioceros jacksonii xantholophus). If we start with some of the research done between 1994 and 2004 and in particular with the UVB information presented in the book; “The Panther Chameleon” (Ferguson et al. 2004), we see that the UVB levels mentioned for keeping healthy Panthers should be in the range not to exceed 5 to 15uW/cm2 from a Zoo Med Reptisun 5.0 linear tube as measured by a Spectroline UVB meter. Further feedback from Dr. Ferguson in 2008 (*) suggests that when measuring UVB levels with the now widely popular Solartech Solarmeter model 6.2, readings from the same type of Reptisun 5.0 linear tube positioned to produce UVB levels in the 10-50uW/cm2 range, should produce adequate circulating levels of provitamin D in Panther chameleons. He also reminds us that if the UVB level is somewhat higher and the chameleon is given the opportunity to photo-regulate by moving in and out of that higher UVB zone that he should be ok too. Of course there are limitations to “higher” UVB levels and photo-regulation. So, we’ll make the assumption that we’re aiming for a basking zone UVB level of 10-50uW/cm2 as referenced to a Zoo Med Reptisun 5.0 linear tube measured by a Solarmeter 6.2 UVB meter. This article will also attempt to correlate the Reptisun 5.0 linear tube UVB levels to other artificial UVB sources. There will also be an attempt to answer why that particular brand and model tube and not just any UVB source that produces 10-50uW/cm2 at the basking zone will have exactly the same level of safety and effectiveness. What about those UVB uW/cm2 measurements? We saw that the Solarmeter 6.2 allows us to measure a UVB source’s output in terms of uW/cm2 (microwatts per square centimeter) at a specific distance. This measurement is a great way to watch the initial output level of a particular UVB source and continue to monitor that level as that particular tube ages in order to determine when it is time to replace it. These meters have a response curve to UV over a range from about 250nm to about 330nm with a peak response at about 290nm. That means that if there is only energy at the desired ~297nm UVB present, the measured microwatt level will represent only that spectral content. If there happens to be energy at any other portion of the 250-330nm spectrum, the meter will include some percentage of it too. What that means is that you might have some nasty energy at 250nm and it will be partially included in the displayed value as if it was something “good”. This is why it is so important to have some baseline data covering the entire spectral content produced by the “UVB” source. 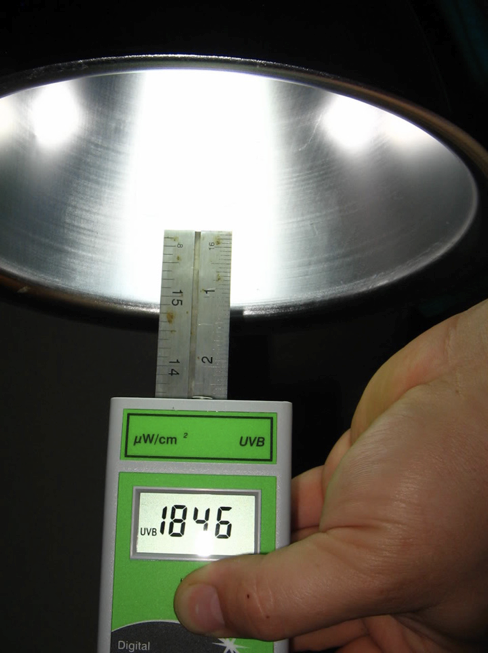 These measurements are often made with instruments like the Ocean Optics model USB2000+ spectrometer as is done by the UV Guide UK team (http://www.uvguide.co.uk). That way you’ll know that there isn’t any harmful spectral content present in the source before it is purchased. UV index is another measurable attribute of sunlight energy and it is of particular interest when dealing with artificial UVB sources since not all wavelengths have the same ability to help or to damage living organisms. UVI is determined by measuring the UV spectral energy at several different wavelengths within the band and then a calculation is made to determine the potential for sunburn based on the incidence of the most damaging radiation (http://www.serc.si.edu/labs/photobiology/UVIndex_calculation.aspx). The Solartech Solarmeter model 6.5 reports UVI. In the case of artificial UVB sources for reptiles, particular attention is paid to the energy levels in the wavelengths below ~300nm since the photo-biological activity, including the ability to damage living tissue, increases as the wavelength shortens. The most serious consequences occur with the short, non-terrestrial wavelengths, which are those wavelengths that are produced by the sun yet are filtered-out by the earth’s atmosphere. Those wavelengths should never be present in any reptile artificial UVB source, yet some manufacturers of reptile lighting have erroneously produced products that actually did output those dangerous wavelengths. Several of those products have either been pulled from the marketplace or are no longer produced. Care must be taken to review the data found on independent reptile lighting sites for information regarding the spectral content and energy levels of UVB products, even if these products are coming from reputable manufacturers. Any product data that is contained in this article regarding a specific manufacturer’s products is subject to change. This certainly will be the case when a UVB product has been or is currently being reformulated by the manufacturer. Here are the physical results of an improperly formulated linear fluorescent UVB tube that produced deadly levels of non-terrestrial UVB, including spectral content reaching into the UVC portion of the spectrum. 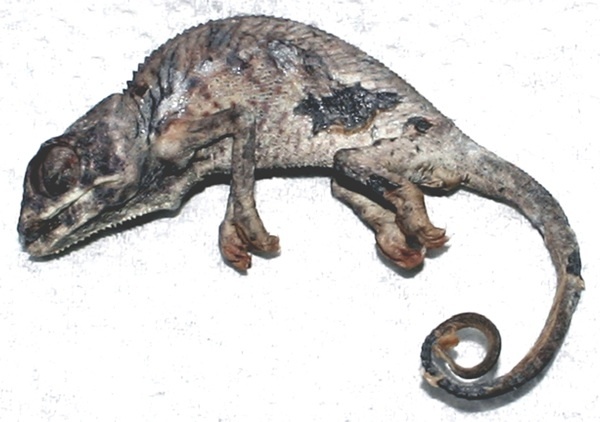 Very short-term exposure caused severe blistering which led to the death of this 3 month-old Panther. 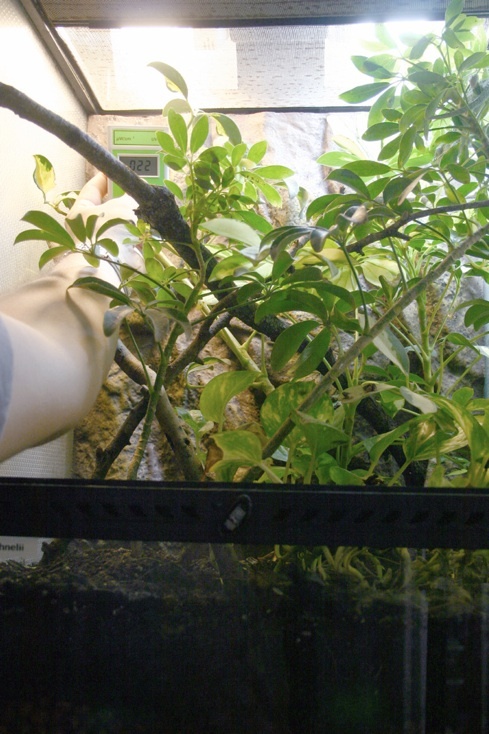 Care must be taken; not only to select the proper UVB source for the application based on its specifications, verify those specifications through an independent information source, but to also to verify the operational characteristics in the actual environment that the keeper intends to use it in before a chameleon is exposed to it. This precaution is intended to minimize the chances of using a product that either does not meet the manufacturer’s specifications or one that comes from a manufacturer that does not specify the UVB output levels of their product. UVB sources come in a variety of specified output levels but, unfortunately there are often unintended variations in output levels from within the same model from the same manufacturer. The type/brand/model a keeper buys new today may not have the same performance characteristics as one bought new just months earlier or months later. That is to say that manufacturing changes; intentional or not, may increase or decrease the UVI and the UVB output levels from their published specifications with the unintended consequences of creating reptile health issues caused by those changes. The responsibility is ultimately left up to the keeper to insure that not only has a safe and effective product been selected by checking its status on the “UV Guide UK” site but to also verify its operational output levels by using a Solarmeter 6.2 while positioning the UVB source over the chameleon’s environment. 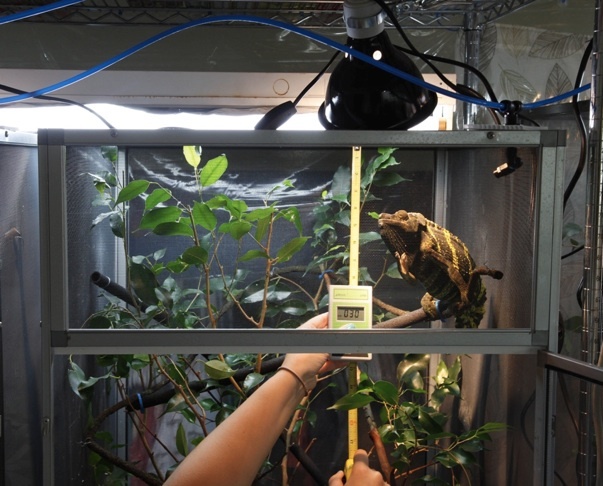 “Over the chameleon’s environment” was very specifically mentioned since positioning all light sources above the chameleon’s environment is the most desirable method for light delivery to chameleons as is likely the case for most reptiles. Aiming either the UVB or other light sources into the side of an enclosure is to be avoided. Side lighting has the potential to increase the possibility of stress inducing glare, excessive UVB exposure to eyes and in general not considered to be a natural lighting effect. It still needs to be noted that UVB does not pass through standard glass and the majority of plastics. Even some fluorescent fixtures marketed to the reptile community still come with a clear plastic cover over the tube that ends-up filtering out all of the useable UVB from ever reaching the chameleon! Most any fluorescent, mercury vapor, and even some metal halide light sources need to be combined with some sort of wide spectrum visible light source. Even a simple household light bulb is usually sufficient to fill-in enough of the missing visible spectral content to promote the healthy growth of chameleons. An incandescent halogen bulb would be an improvement over the standard household bulb since the halogen bulbs have an inert gas and a halogen like iodine or bromine added that produce even more of the visible light spectrum (still no UVB) somewhat closer to the spectral content of unfiltered sunlight. These incandescent light bulbs are also often very effective at fulfilling the basking heat requirements for chameleons too. Okay, let’s “cut to the chase” and delve into the common UVB lighting technologies applicable to chameleons. One of the most popular UVB light sources used in the chameleon community is the purpose-built, reptile UVB fluorescent tube. There are a number of UVB fluorescent tube shapes and styles available including circular, U-shaped, linear and the CFL (compact fluorescent light). The linear and CFL shapes are the most popular. Linear tubes are externally ballasted and available in 15, 18, 24, 36 and 48 inch lengths with 18” and 48” being very popular. Most often, the reptile UVB fluorescent tube industry rates their product’s UVB output as a percentage of its overall light output. This percentage specification ranges from 2.0 to 10.0 with 5.0, 8.0 and 10.0 being commonly available. As you might have guessed by now, these percentage values don’t tell us the whole story regarding the uW/cm2 output levels and don’t give the consumer adequate information regarding spectral content even if the box has a spectrum plot on it. The best way to pick the right UVB fluorescent tube for your chameleon’s living space is to first refer to the latest information made available on the “UV Guide UK” website. There you can confirm the safety of the spectral content, the uW/cm2 output levels, and the UV Index, all at particular distances. Then you’ll be able to cross reference the percentage ratings of particular makes and models to the actual output levels before you go shopping. For example, a Zoo Med Reptisun 5.0 linear 18” tube positioned 8” away will deliver about 30uW/cm2 of spectrally safe UVB. Like all UVB sources, the output levels will change with use over time. Fluorescent tubes will likely need to be replaced at some point after 6-12 months of operation at 12 hours a day. If you have a Solarmeter 6.2, you’ll be able to monitor this aging process. There are a couple more specifications to take into account when choosing fluorescent lighting. 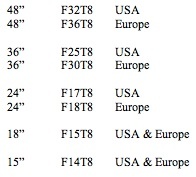 There are various tube diameters available. This diameter specification is called out in 1/8ths of an inch. For example, a T8 tube is eight 1/8ths of an inch which equals 1 inch in diameter. A T12 is twelve 1/8ths which equals 1.5 inches in diameter. Although a T8 and a T12 have the same electrical pin configurations and will fit into the same socket, their wattage ratings are different. The wattage of the tube is usually found along with the diameter specification. A 48” long tube with a specification of F32T8 generally means it is 32 watts while an F40T12 is 40 watts. Putting the wrong fixture (ballast rating) and tube rating together may result in the UVB/visible light output being reduced or not working at all or the reverse happening with excessive UVB/visible light output levels and a severely shortened tube and ballast life. Fluorescent T12 tubes, both UVB and non-UVB, are being phased out of the worldwide lighting marketplace by the T8 because they are more energy efficient and essentially produce the same UVB energy levels as their T12 counterparts. Magnetic ballasts are generally less efficient than electronic ballasts. Electronic ballasts not only waste less electricity but they also tend to help the tube produce its maximum light output too. 18” Zoo Med Fixture still uses a magnetic ballast. CFL UVB lights are self-ballasted (the electronic ballast is built into the lamp’s base hardware) and often found in 2.0, 5.0, 7.0, 10.0 percentage ratings with 5.0 and 10.0 being the most common. Remember, those percentage specs should be used more as a model differentiator than as a guide for comparing one manufacturer’s product to another’s. Like their linear counterparts, CFLs are available in several power consumption ratings with 13 watts and 26 watts being common values. Intrinsic to both the spiral and the folded compact tube design is the high energy density. Think of this “density effect” as if there are multiple tubes tightly stacked next to each other, each outputting levels that when combined, add up to uW/cm2 levels much higher than their spread-out linear counterparts. Once again, this why it is important to refer to the “UV Guide UK” site to find the latest specifications for microwatt levels at particular distances as well as UV Index specifications, when available. While it would be possible for a particular manufacturer to make both linear and CFL UVB tube models using the exact same phosphors and quartz glass; which largely determines the spectral content and uW/cm2 power levels, this is often not the case. Don’t think of a particular brand name as the manufacturer’s but only as the distributor of the brand of UVB product. The actual manufacturer of a distributed linear tube may not be the same manufacturer of the distributed CFL tube even though the name on both boxes is the same. These two products, with the same brand name may be just as different in capability and even safety as if they were made and sold by two different companies as is often the case. Mercury vapor (MV) lamps are available in a self-ballasted (SB) configuration and also in an externally ballasted (EB) configuration. In addition to producing UVB, the SB-MV lamp produces a large amount of heat from its ballast filament at a level similar to an incandescent light bulb of similar wattage. An EB-MV does not use a hot filament (the electronics are in a separate box cabled to the lamp) as part of its ballast circuitry therefore it does not produce nearly as much heat as its SB counterpart. A number of reptile-specific manufacturers make MV lamps capable of producing UVB, with some being available in a flood and others in a spot configuration. MV lamps are offered in a variety of UVB output levels (and heat producing wattage levels) for uses ranging from the typical hobbyist’s environment all the way up to commercial zoo environments. Part of the difficulty in selecting MV lamps; or most any UVB source for that matter, based solely on their advertised specifications is that not only might the actual UVB uW/cm2 and UV Index values not be supplied by the manufacturer but even the input power specification (70W, 100W, 160W etc.) have been found to be incorrect by more than double! Independent research of one model MV that was labeled 70W on the box and on the lamp body was actually consuming 197 watts at 120V which means that it was likely also producing more than double the heat too. Note that this error was present within several companies’ products lines. Other issues come from manufacturers changing their lamps’ construction materials causing excessive UV Index and uW/cm2 levels. If the keeper doesn’t have access to both a UVB uW meter and a UVI meter, they must rely on information from sources like the UV Guide UK; even with name brand lamps, in order to safely select and use these products. Keepers must also cross their fingers that the manufacturer doesn’t change their formulas and processes producing a product of unexpected high or low performance that hasn’t been independently tested and published at the time of their purchase. One of the fundamental choices that need to be made with MV lamps is “To Heat or Not to Heat” (that is the question!). Since SB-MV lamps produce both UVB and heat, the keeper must determine if a proper balance of heat and UVB can be found with a particular brand/model. A keeper may discover that in order to position the lamp to get the desired UVB level, the heat may end-up being too high or too low at the basking spot. An EB-MV lamp doesn’t produce nearly as much heat so an incandescent light will likely need to be added which means that the keeper can tune the positioning of each source independently to reach the optimal level for both heat and UVB. EB-MV lamps do not suffer from the easily broken filaments of SB-MV lamps either. There is an initial investment in the external ballast electronics but it is usually just a one-time investment. The MV lamps used with external ballasts, are as you’d expect, less money to start with and last longer than their SB counterparts. Metal Halide (MH) lamps are basically mercury vapor (MV) lamps with additional metals added to the “recipe” to improve the spectral content and output performance. With the proper metals and glass formula, these lamps can produce not only excellent overall visible spectral content; they can also be tuned by the manufacturer to produce safe and useable UVB. While MH lamps may be available in a self-ballasted configuration for “human” lighting purposes (not as a UVB source) those that are being designed specifically for reptile applications will be externally ballasted units. ReptileUV (http://www.reptileuv.com) is in the middle of research to produce a reptile-purpose-built Mega-Ray® Metal Halide UVB EB Kit consisting of a 70W MH lamp, fixture and external ballast. The reptile community is eager to see if this product comes to fruition. In Europe, the company “Lucky Reptile” has been selling UVB metal halide lamps for several years. Be aware that unless a MH lamp is purpose-built for reptile applications and verified safe and effective it should be strongly avoided. There has been some suggestion that certain industrial MH lamps could be used for reptile UVB applications after their safety filter has been removed. Removing the filter will likely allow unsafe spectral content to reach your reptile (and you too!) and should not be attempted. Other non-reptile MH lamps have integral filters as part of the bulb itself and thus can’t be removed. This insures that they are safe for human lighting uses but will also not produce any UVB for reptile use. They can still be used for excellent non-UVB reptile lighting. Here is an example of a pre-12/2009 Zoo Med Reptisun 10.0 CFL made with the incorrect phosphor formula. There are several things to note. Even with a good phosphor formula, a keeper would never use a CFL at this close of a range since the uW levels would be far beyond the safe levels for any living organism, let alone a chameleon. This unit measures 1846 uW/cm2 at the dangerously close distance of 2.5” from the reflector’s lip. While a reflector is an effective means of controlling the direction of the light, a keeper must take into account that that the total UVB energy directed towards the chameleon could be almost double that of a CFL not properly housed. Also, the 1846 uW/cm2 reading does not represent the complete level of danger here since this incorrect phosphor also produces non-terrestrial spectral content that, as discussed earlier, makes this example even more dangerous. Zoo Med includes an instruction sheet with every CFL sold. If the instruction sheet date code (lower right corner) is any date before 2009 then it should not be used. This free-range configuration for T. melleri uses a combination of a 10.0 T-8 Zoo Med Reptisun 48” tube for UVB along with a standard 6500K “grow light” for the plants, all housed in a dual tube aluminum reflector shoplight type fixture. It measures a safe and effective 31 uW/cm2 at 16”. In this example, an 8 month old Exo-Terra 26W Reptiglo 5.0 CFL is mounted in a standard Exo-Terra hood with shiny metal reflector. At approximately 6" this unit measures a safe and effective 22 uW/cm2. 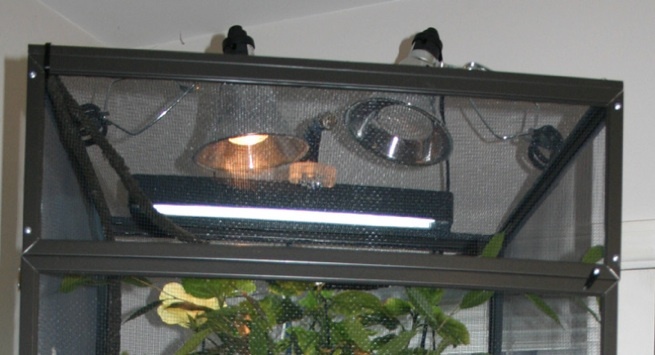 This all-screen chameleon enclosure has a linear Reptisun 10.0 and a 6500K “grow light” mounted in a dual 48” shoplight fixture, lined with reflective aluminum foil to direct more of the light towards the basking area. The Solarmeter 6.2 is held 8.5" away and shows a reading of 30 uW/cm2 after the normal loss through the aluminum screen. This tube is 3-4 months old and is still delivering adequate levels. This linear 18” Zoo Med Reptisun 5.0 is mounted in a simple ESU fixture with a reflective backing. The fixture is sitting on top of the screen, approximately 8” away from the basking area. This 5 month-old tube still measures 22 uW/cm2. Chameleon UVB requirements – 10 to 50uW/cm2 of UVB with a safe UV Index level and use a Solarmeter 6.2 to confirm with readings. Fluorescent linear tubes - The Reptisun 5.0 linear fluorescent tube is considered the first choice. All other should be verified on the “UV Guide UK” for safety and effectiveness. Compact Fluorescent Lights – Refer to the “UV Guide UK” for safe and effective choices. Mercury Vapor lamps – ReptileUV Mega-Ray, Zoo Med PowerSun, T-Rex Active UV Heat lamp, and the Exo Terra Solar Glo are all possible choices but refer to the “UV Guide UK” for safety and effectiveness. Metal Halide – Follow ReptileUV for progress with this product’s development. UVB sources without independent data and proven track records should be avoided. Just as Andy left open the possibility for this “Part 2” article, I’ll leave open the possibility for a “Part 3” chameleon lighting article that could cover their non-UVB lighting requirements, basking and ambient light levels, methods to measure those levels, product types and models along with any other relevant information available. 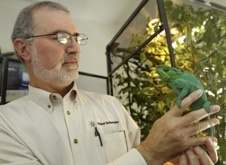 This author wishes to thank Frances M. Baines, MA., VetMB., MRCVS for her guidance and words of wisdom that helped shape this article, not to mention her dedication to UVB reptile research provided to the public through the “UV Guide UK” (http://www.uvguide.co.uk). Additional, late-breaking news and information can also be found on the “UVB_Meter_Owners” forum at http://pets.groups.yahoo.com/group/UVB_Meter_Owners.